« “Mission Accomplished” (again) – Now Let the Civil War Begin! 21 American troops killed fighting the Taliban in 48 hours. US General David Petraeus acknowledged Tuesday that the Taliban were expanding their footprint across the country even as foreign forces close in on their traditional southern strongholds. Petraeus acknowledged the spread of Taliban influence, especially to parts of the formerly peaceful north, but said the campaign to counter the insurgency was nearing its final stages. Really? “I don’t think anyone disagrees that the footprint of the Taliban has spread,” he said, adding the insurgents had “reconnected in various safe havens and sanctuaries outside and inside the country,” a reference to Pakistan. However, Petraeus said a sharp rise in attacks on international troops showed that the hardline Islamist militia were feeling threatened in their safe havens after almost nine years of war. 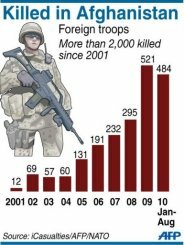 The number of American troops killed fighting the Taliban hit 21 on in the last 48 hours. “Levels of attacks have gone up and that’s a manifestation of us increasing our resources substantially and taking away safe havens that the Taliban have been able to establish over the course of the last several years,” Patraeus said. In other words, Patraeus is saying that America’s success in Afghanistan is resulting in more American combat deaths. This misleading and self-serving logic is Petraeus’ attempt to excuse his failure and to deceive the American people.